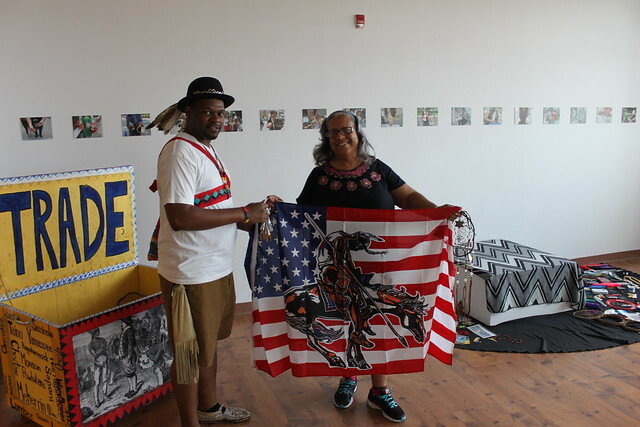 I am a mixed-blood Native American and African American artist living in the south Bronx, and I am inspired to create artwork based on the familiar objects I see every day, such as details on buildings and everyday items in the home. I ultimately set out to express a story through mixed media. In 2000 and 2004, I produced two mixed-media performance projects at The Point’s CDC space, “Live at the Edge.” The performances, titled “Clothesline” and “The Love and Fear Experience,” featured visual art, dance, music, film, spoken word, and photography, and explored coming of age in the Bronx, rituals and tradition, child abuse, racial and sexual identity, religion, and self-pride. I have also worked with the Bronx Museum of Art on its first community art award grant, where I collaborated with many artist and performers. In 2014 I worked on “Standing on Shaky Ground,” representing Native American and Black struggles, depicted in the photographs below. I believe we all have a story to share.